The unicorn is a horse-like creature with a single long horn protruding from its forehead. It is a myth, yet here it is mentioned in the King James Bible, not only once but nine times in five different books. Even God spoke about unicorns in Job 39:10. Atheists use these verses to mock the Bible. The unicorn metaphorically portrays power (see also Numbers 23:22 and Psalms 22:21). It was a powerful beast capable of breaking bones and destroying enemies. However, if an ancient king used our modern unicorn to depict his strength, at best it would produce a smirk or worse outright laughter. There is a simple explanation. In 1611 — the year the King James Bible was first published — the word unicorn had a completely different meaning than it does today. The best way to explain this is by looking at how unicorn was translated in different editions of Webster’s dictionary. 1. an animal with one horn; the monoceros. this name is often applied to the rhinoceros. Originally, the word unicorn– from the Latin “unicornis” — meant simply “one horn” and was routinely used for rhinoceros. If you look up rhinoceros in the 1828 edition you will see the single horned rhinoceros referred to as a unicorn. Since we now envision the word unicorn as a horse with a single horn, modern Bible translations no longer use the word. Will the real unicorn please stand up! The reason rhinoceros is strong consideration for a r’em is because of how the word is used in those verses. But my horn shalt thou exalt like the horn of the unicorn. There are few single-horned animals and when you tie that with the power metaphor, the rhinoceros quickly rises to the top of the list. There are five species of rhinoceroses alive today, three are two-horned and two are single horned. Though oxen were used for ploughing fields, the same could not be said for rhinos which due to its massive size (upward to 2.5 meters long 12′) and ornery disposition would be extremely difficult to domesticate. But I don’t believe r’em was referring to any of our modern species of rhino. I suspect the Bible was talking about an ancient and now extinct species of rhino called Elasmotherium. Fossilized remains show the Elasmotherium was a huge rhinoceros about 6 metres (18′) long and well over 2.1 metres (7′) tall at the shoulders. But perhaps its most imposing feature was a single, massive horn on its nose which was estimated to be two metres (six feet) or longer. This monstrous beast would strike fear in the heart of any man, particularly if it had the ugly temperament of today’s rhino. The horns of modern single-horn rhinos range in size between 20 to 100 cm (8″ to 39”). Though a decent size, they are certainly not imposing. But compare that to Elasmotherium’s two meter (6 foot) horn — its most dominating feature which towered over the rhino — and suddenly comparing one’s exaltation to the exaltation of a unicorn’s horn makes sense. There is another Biblical description that adds to the Elasmotherium theory. The verse cited at beginning of this article described young unicorns skipping or jumping in play (Psalm 29:6). Maybe it’s just me, but rhinoceros and skipping do not belong in the same sentence. Its legs were longer than those of other rhinos and were designed for galloping, giving it a horse-like gait. With a horse-like gait, an Elasmotherium calf could easily be envisioned as skipping through the meadows. But the Bible is not the only place to record man’s contact with Elasmotherium. In French caves, there are drawings of Elasmotherium. Turkish writings describe a huge 3.5 meter tall animal (12′) with a massive horn. In China, there were sightings of Elasmotheriums dated to 481 B.C. along with drawings. 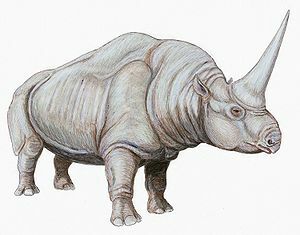 There are other records of this ancient rhinoceros from Russia, Iran and Arabia. Near this river (the Volga) is a vast wilderness wherein they say is an animal that is less than a camel and more like a bull in size. Its head is like the head of a camel, and its tail is like the tail of a bull, while its body is like the body of a mule, and its hooves are like the cloven hooves of a bull. In the center of its head, it has a thick round horn, which as it rises from the head of the animal gets to be thinner until it becomes like the point of a lance. The length of some of these horns is from three to five cubits, [a cubit is roughly 18 inches putting the range between 4.5′ to 10′] and there are those that may attain to a greater or lesser length. The animal grazes on the leaves of trees, which are quite green. When it sees a horseman, it makes straight for him, and if he happens to have under him a fast horse, he is rendered safe from it with some effort. If it overtakes him, it removes him from the back of his horse with its horn, hurls him into the air, and then catches him with its horn. It continues in this manner until it kills him. It does not bother the horse in any form or manner. They seek out this animal in the forests in order to kill it. They do that by climbing the tall trees among which it is found, and with this object in mind, they assemble a number of archers with poisoned arrows. When it stands in their midst, they shoot at it until it is severely wounded and killed by them. I saw in the king’s house three large bowls which looked like [they were made of] the onyx of Yemen. The king informed me that it was made from the base of the horn of the animal. Some of the people of the country told me that it was a rhinoceros. I am thinking this is the base of the horn of a Elasmotherium.